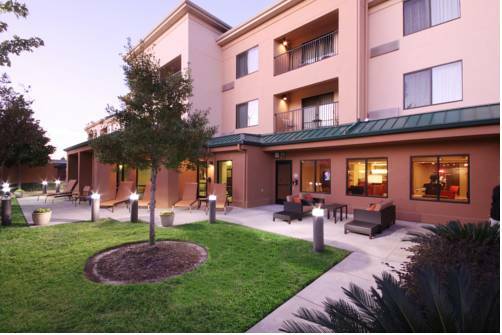 The recently renovated Courtyard Houston North surpasses other Houston Airport hotels with our combination of form, functionality and everyday value for today's busy traveler. We know convenience is key, thats why Courtyard Houston North is one of the only hotels in North Houston with free shuttle service to/from the terminals (request hourly service between 5 AM - 12 AM). Nearby you'll also find dining, shopping, and entertainment as well as attractions like Splash Town and Cynthia Woods Mitchell Pavilion and offices like Halliburton and GE. When you stay with us, you know youll find the amenities you deserve. Our hotel provides free WiFi and state-of-the-art lobby features like our GoBoard and comfortable media pods. Fuel up in the morning with a healthy breakfast and your favorite Starbucks beverage at The Bistro or drop by at day's end for dinner and cocktails. Come discover why Courtyard by Marriott is the new favorite of hotels in North Houston. We look forward to having you as our guest.